WASHINGTON/BEIJING (Reuters) - U.S. President Donald Trump said on Tuesday that he could let the March 1 deadline for a trade agreement with China "slide for a little while," but that he would prefer not to and expects to meet with Chinese President Xi Jinping to close the deal at some point. 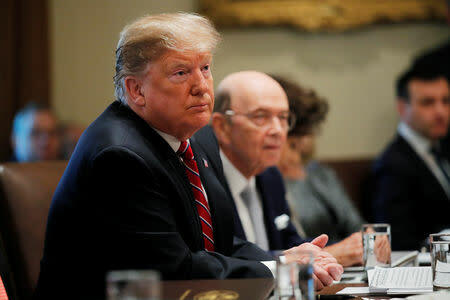 "If we’re close to a deal where we think we can make a real deal and it’s going to get done, I could see myself letting that slide for a little while," Trump said of the deadline at a White House cabinet meeting. "But generally speaking, I’m not inclined to do that." "We’re doing very well over in China," Trump added. A growing number of U.S. businesses and lawmakers have expressed hopes for a delay in the tariff increase while the two sides tackle the difficult U.S. demands for major "structural" policy changes by China aimed at ending the forced transfer of American trade secrets, curbing Beijing's industrial subsidies and enforcing intellectual property rights. Senator Rob Portman, an Ohio Republican, said he discussed the U.S.-China talks with U.S. Trade Representative (USTR) Robert Lighthizer last week, and added that he thought the talks were "constructive and serious." "I think they’re making progress and my hope is that by March 1 there will be enough progress to be made that at a minimum, there could be a delay in the imposition of additional tariffs," Portman told reporters. Portman, who served as USTR during the George W. Bush administration, added that the Trump administration "is committed to structural reforms at this point" and Trump is less likely to settle for a deal mainly focused on increased purchases of U.S. commodities. Erin Ennis, senior vice president of the U.S.-China Business Council, said more time may be needed for a deal, which will require a meeting between Trump and his Chinese counterpart to complete. U.S. stocks rallied on Trump's trade comments, along with a tentative congressional spending deal aimed at avoiding another government shutdown. All three major indexes posted their biggest one-day gains for the month so far, with the Dow Jones Industrial Average snapping a four-day losing streak to rise 1.5 percent and the S&P 500 gaining 1.3 percent. Lighthizer and U.S. Treasury Secretary Steven Mnuchin arrived in Beijing on Tuesday and are scheduled to hold talks on Thursday and Friday with Chinese Vice Premier Liu He, the top economic adviser to Xi. The latest round of talks in Beijing kicked off on Monday with discussions among deputy-level officials to try to work out technical details, including a mechanism for enforcing any trade agreement. A round of talks at the end of January ended with some progress reported, but no deal and U.S. declarations that much more work was needed.